Tara & Roger had a wedding in a beautiful rustic barn in the Myrtle Beach area surrounded by historic farm buildings and sugar cane fields. 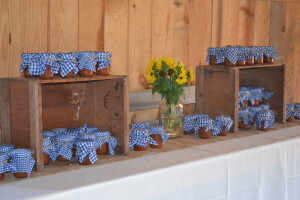 For the couple that wants to have a casual, earthy, beachy wedding there are so many neat ideas. 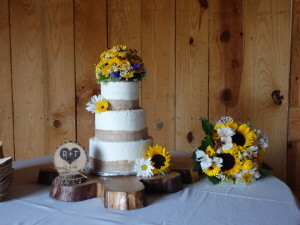 Burlap, rough wood, sunflowers to wild flowers and shells can add those touches. Many couples are crafty and have fun making signs, cake stands, table numbers or signs, card boxes ., etc., and anything that brings out their unique personalities. 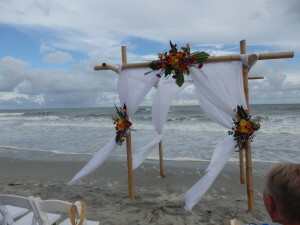 The Bamboo Chuppah with white sheers can be erected on the beach at your location. White artificial flower arrangements are added & tied with flowing ribbon in your wedding color. The price is $300. 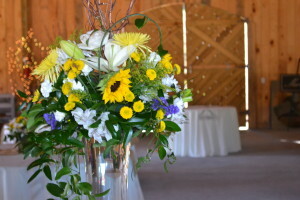 If you prefer live arrangements, your floral designer will make up those for placement on the Chuppah. If you want to add the white chairs those can rented and placed in front of the Chuppah. The Horry County Probate Court Office no longer accepts Marriage License applications by mail. You must apply in person on a weekday. It is located in Conway, SC at 1301 Second Ave., Conway, SC 29528. The phone number is 843-915-5370. They require a Driver’s License and Social Security Card for proof of identification. After applying, you must wait 24 hours to go back to pick up your license to give to the officiate before the ceremony. I may be able to help you with applying for your marriage license if you can not apply on a weekday before you come to pick up your license. There is nothing more beautiful than the enormous live oak trees in the Myrtle Beach, SC area. 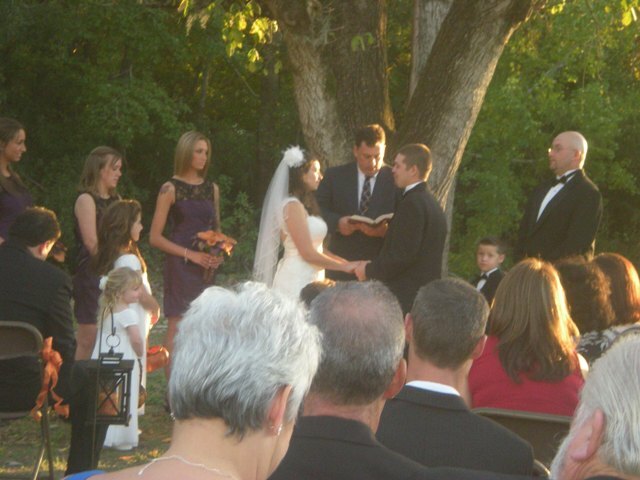 Some couples prefer getting married under the shade of the live oaks in a Plantation type setting. I’ve toured quite a few lately and would be hard pressed to pick one. I listen to my couples and then determine what venue would be the best fit for them. The next step is to set up some site visits and get their feedback. 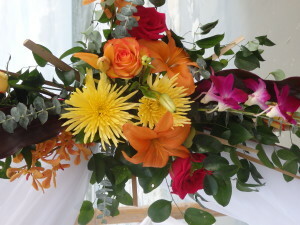 Most beach weddings will not require the issuance of a Special Event Permit. The threshold for requiring a Special Event Permit are 500 or more participants, 100 or more chairs, tents greater than 12 x 12 or multiple tents and weddings that do not meet the standards. 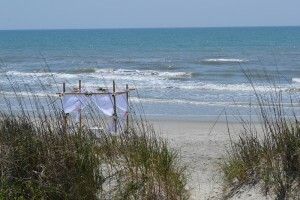 Beach weddings are permitted in certain areas. Each community/city has their own rules and regulations whether it is in North Myrtle Beach, Myrtle Beach, Surfside Beach, Garden City Beach, Murrells Inlet, Pawleys Island Beach and Litchfield Beach. 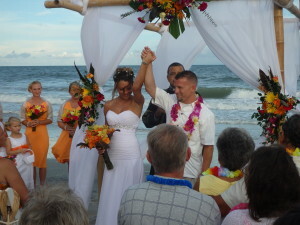 The City of Myrtle Beach does not allow beach weddings within the city limits. 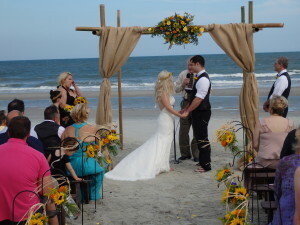 Weddings on the beach are allowed outside the city limits in the unincorporated areas of Myrtle Beach. All other areas permit beach weddings and have guidelines that must be followed. Your wedding planner can help you select a location that permits beach weddings & help you adhere to the rules. The last thing you want on your wedding day is to have to your wedding broken down. Your wedding planner also is required to purchase a Business License each year for the areas they work in. Peak Beach season is May 15 to Sept. 15. I suggest having your ceremony at 6 PM or later during this time for several reasons. The sun is not as bright and your pictures turn out better. Everyone is not squinting & pictures are not washed out. It is a little cooler. Most folks that are enjoying the beach start leaving around 5 PM. You have more room in certain areas. There will be more parking spots. You can not set up any type arbor, 12×12 tent, no higher than 9 ft. tall, can not be connected to another shading devise, etc. that will block the view of the lifeguards in their attempt to keep the beaches safe. These have to be at least 10 ft. behind the lifeguard stand. You must stay behind the beach umbrella line when those are put out by the franchise company that rents those. There are limits on the number of chairs that can be placed on the beach. No more than 20 chairs can be placed on the beach for safety purposes before 4 PM. After 5 PM. up to 50 chairs are allowed. Any set up must not block an emergency beach access or the walkways. You don’t want people walking through your wedding anyway. I suggest setting up to the left or right of the walkway about 30 ft. from the walkway at least. Setup can not occur more than 2 hrs. before the ceremony & can not be left unattended. Parking must be in the appropriate parking areas or you will be fined and/or towed. No power cords or generators are allowed on the beach, near the beach or in the Sand Dunes. A portable battery system is allowed. The beaches a public, so you can not rope off an area. 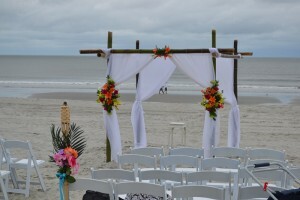 You can set up beach chairs and have someone in your group occupy the area you want to have for your wedding ceremony. You can ask beach goers to move, but they are not required to grant your request. Many times they have too much in place to want to move for your wedding. Be nice to the environment and don’t use rice, confetti and silk flower petals on the beach. The sea birds will try to eat anything and it will wash in the ocean when the high tides come up endangering the sea life. No glass of any shape or form is permitted on the beach. Glass containers for the Sand Ceremony are not permitted. Alcohol for toasts is not permitted for any reason nor the glass bottles they are in. Glass containers of flowers can not be placed on the beach. The wind can blow these right off the table, etc. Any set up left on the beach after 7 PM will be collected by the Beach Patrol. Fireworks are not legal on the beach in Myrtle Beach or any surrounding communities. They are only legal when a company has a permit to do so on special occasions. Sparklers are considered fireworks. Chinese Floating Sky Lanterns are considered fireworks because there is fire inside. The Sparklers are dangerous as they produce sparks & embers which can burn clothing and light into hair which may have hairspray (very flamable). The dunes, sea grass and all vegetation can be very dry and start grass fires. The wind blows in all directions. It is not always blowing out to the ocean. It is always blowing and at times it is stronger than other times and changes in minutes. It can be mild and go up to 40 mph or higher. The Sky Lanterns can blow onto a house, in trees and vegetation and start fires. Even though the directions say they are environmentally safe and fire goes out in minutes, this is not true. There are wires that fall into the ocean or on the ground. The sea life and sea birds are ones that suffer due to getting this TRASH hung in thier throats. Over 975 acres of land and houses were burned in this area recently and attributed to a Sky Lanterns landing in a tree. You will be prosecuted for causing damage to lives and property. Bon Fires are not allowed on the beach. The beach patrol will fine you for doing so. I wanted to say thank you so much for all your help and making the event very special. 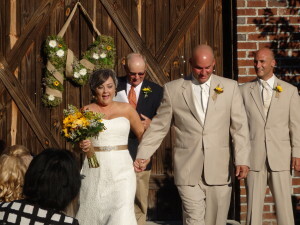 Everything went great and my in laws had the best time. They were completely blown away by the surprise. Would not be possible without all the work and help from you. My husband says thank you too. I hope you had a chance to enjoy your birthday for at least a little bit in the evening! Thank you for all you did for us before, during and after the wedding. You have nerves of steel! Thanks again! Hope to see you around! Dear Cheryl, Corky & I want to thank you for coordinating the events for Chris and Jenny’s wedding day. It was so reassuring knowing you were there to make certain everything ran smoothly. We all have a beautiful day to remember. The deadline is fast approaching for entering the chance to win a free wedding if you are active Military is March 30, 2013. To enter go to www.operationhappilyeverafter.org. If you are having trouble entering please call me. The lucky couple will be selected around April 6, 2013. 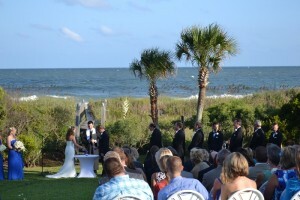 The wedding will take place on Sept. 7, 2013 at an oceanfront resort. What I didn’t realize is the included in the package are the wedding rings with a value of $4,000. If know anyone that is planning a wedding and would like there dream wedding in Myrtle Beach, South Carolina, please do not hesitate to tell them about this opportunity to get it for free.